The Stafford Gel Euro Top offers the rarely-seen SuperLastic Coil Unit. This rarely-seen variation of the Continuous Coil design model offers both durability and contouring comfort. This particular model is best suited for sleepers who are seeking a long-lasting and durable mattress but who also wish to have a medium to medium-plush feel. 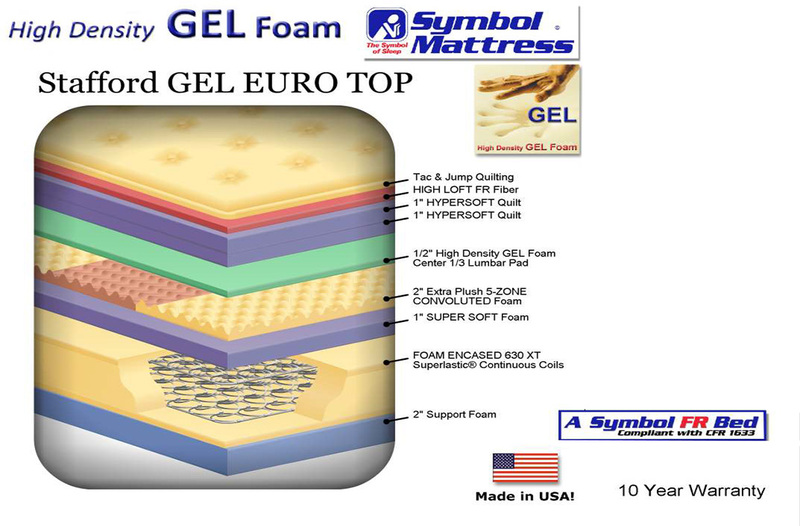 Many of the 'bells and whistles' of more expensive mattresses are featured with the Stafford Euro: GEL Foam Lumbar Pad, Dense Foam Encased Edge, Premium Coil Unit (Superlastic) and a Non-Prorated Warranty. All of this has combined to make this mattress a favorite in our showrooms for many years. 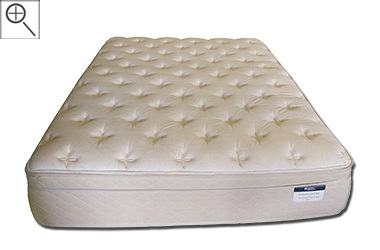 The Stafford Euro Top may be the best value for a medium-plush mattress shopper, in the entire industry! It has the same extra heavy-duty coil unit (Superlastic) as the Stafford Extra Firm but adds a gel foam euro top that is over 2" thick! Still under $600 (in a Queen Size) it's nearly impossible to find anything even close to this level of quality, for a competitive price. A gel lumbar pad adds additional support in the areas that you need it most and, after prolonged time on the bed, it's noticeable. The Superlastic coil unit bends and contours with your body but is made up of a much stronger construction and metal than the constantly-referenced "pocket coil". 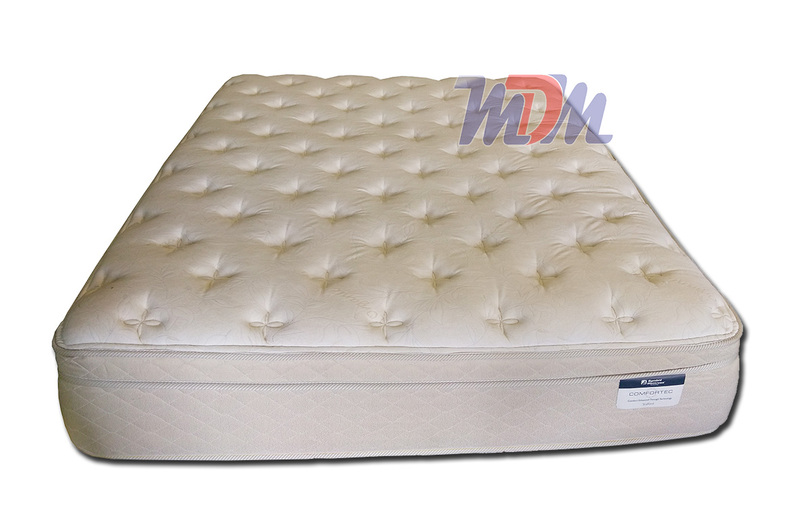 Deep-down 5-Zone foam adds even more support and - for a mattress with a medium to medium-soft initial feel - this model surely feels very sturdy and reliable. 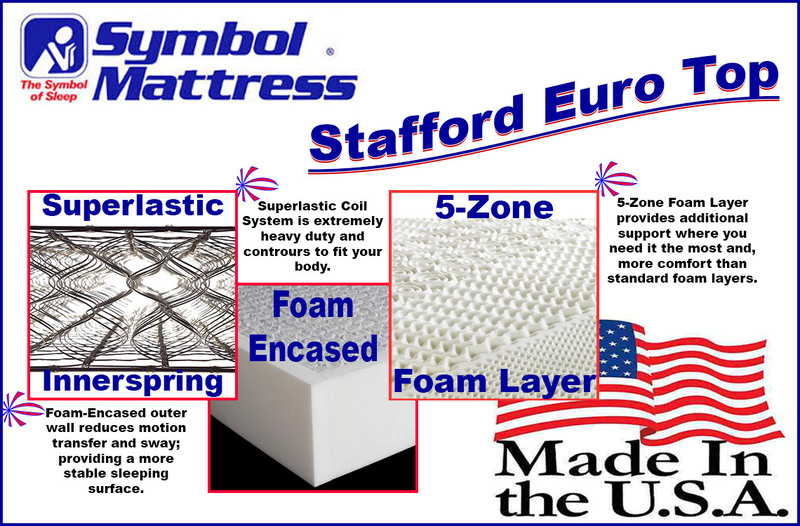 All Symbol Mattresses are Made in the USA and so is their foam. This is another reason that many customers seem to purchase their products with confidence. If you're looking for a medium-cost mattress with a soft feel but a strong construction: The Stafford Gel Euro Top is for you!